Turner prize nominee Jeremy Deller has been commissioned to produce an installation inspired by the English garden allotment. With the ceremonial unveiling of the new Louis Vuitton boutique at Westfield, London, we are treated to a collaboration with British artist Jeremy Deller as he plays homage to the English garden allotment. If you make it to Shepards Bush within the next two weeks you will encounter bails of straw flattened to frame mobile black plastic sacks jammed to bursting with flowers and vegetables. 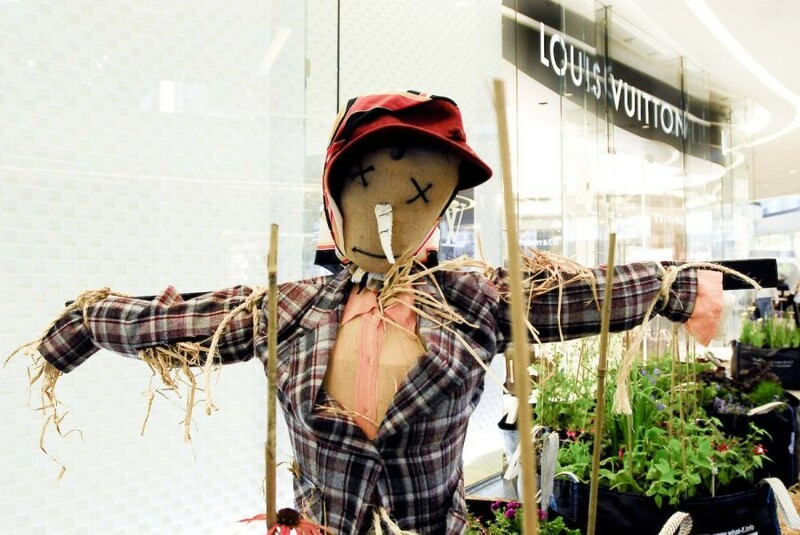 The garden is overseen by a Scarecrow (unfortunately not dressed in Louis Vuitton), which adds to the surreal attraction when entering the store. Inspiration for the installation was springtime in the city, an exploration into how Londoners utilise small spaces. The art piece is to be donated to Hammersmith community as part of a regeneration project for the area. Jeremy Deller, the 2004 Turner Prize winner, talked about the project "In London we have to appreciate nature wherever we can find it, combining the strange beauty of the scarecrow with a mobile urban vegetable patch." The installation runs at Louis Vuitton, Westfield, London from 19 - 26 May 09.